DO NOT USE DONGLE IF YOU DONT HAVE TO!! Posted: Thu Aug 26, 2010 6:22 pm Post subject: DO NOT USE DONGLE IF YOU DONT HAVE TO!! forced updates are being pushed to clients, when the update is done your client randomly generates passwords each time it is connected. If you update your client your SIP info will NO longer work!!! Until something is figured out DO NOT UPDATE!!!! That's odd. I have been using MJ via an ATA for a couple years now, first standalone, and now through a MJMD5 proxy. Against my better judgment, I let curiosity win out, powered down my ATA and proxy, and I plugged in my MJ dongle the day after the new version of the software came out. I plugged it into a Windows 7 machine that had never had MJ installed. It did it's lucky you thing, downloaded and installed and worked with the new software. I uninstalled it, put it back in the drawer, and powered up my proxy and ATA. The ATA still works with the old password. And, BTW, I have NEVER entered a user agent string, either. YMMV, but for me, I have NEVER had my SIP password change, despite several years of use. Just curious: maybe those continuously changing PWs you are seeing are not your actual SIP PW, but are used for something else. Update: well, like most ATA users, I spoke too soon. On Monday, 8/30, mine stopped registering via MJMD5 proxy. IMO, since the new software changes the SIP password every time the client registers with the host, MJ use via ATA is history. Steve I wonder if you got the update I got yesterday where it still worked. I just worked with spider for the last few hours this is what i have found. 3. 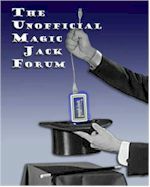 The password changes each time you plug the magic jack in. I believe this is creating a new password on each use. There are a few sites I see it connect to that I have never seen it connect to before. The first attempt by the jack to register fails. then there is a hello packets and shortly after it seems to try to register again. The goal would to be to guess or figure out the next password that would be assigned to your jack and use that. the issue in this is any time you shutdown your proxy it will be needed again. I strongly suggest that those that are using the service without the jacks , don't plug in any time soon. Hopefully some one out there will figure a way around this. Though I am guessing unless there is real need or motivation it will be some time. its not only if you use the dongle even if you send a request to the provisioning server. I'm sure that the math will get figured out eventually. or maybe not. I just sent a request to it and nothing negative happened that I can tell my pbx is still working. Posted: Thu Aug 26, 2010 10:33 pm Post subject: Re: DO NOT USE DONGLE IF YOU DONT HAVE TO!! I know you made this quote with the best of intentions and I honestly believe you are having an issue. Please refrain from engendering FUD to the general public based on your unique situation that has not been reported by any other reliable witness. There is enough speculation and harum-scarum being disseminated along with verifiable, repeatable changes. We would rather have time and resources applied to the verifiable issues. Chalk up your issue to sunspots, bad ram or a wonky power supply but please stop crying wolf based on your singular experience. I meant obtaining your SIP info with out doing a dump or using the dongle. I am just as confused as the next person on this crazy hipe spreading. After working with spider210. I retrieved and tested 4 other jacks tonight with no problems. I'm in the same boat as spider. I have two MJ's one that's been updated and one that's not. The one that's been updated gets a different password with every dump I do now. The one that's not updated continues to work with it's present sip credentials and mjmd5. Posted: Fri Aug 27, 2010 12:46 pm Post subject: Re: DO NOT USE DONGLE IF YOU DONT HAVE TO!! Thanks but no thanks to your input. This has been verified and well if you and others have not received this update its only going to be a matter of time before everyone gets pushed this update. This is also on old hardware too, original mj. So just because you have yet to experience it doesn't mean this is a solitary case. So next time, we hope your input will be more helpful. I agree with you Spider, but definitely not with your wording..., it is a real issue. Let's just hope that it doesn't affect everyone. I still have one of my MJ numbers that can run w/o MJMD5:), but on another I received the latest update and can no longer use it with MJMD5, luckily I have a few spares. Completely unable to get ahold of my SIP info. Used all available programs/methods, a different password is returned each time and all don't seem to work with X-lite (401 unauthorized). Just renewed a few days ago and received an update on my MJ (8/15/2010). I've just found out that, after the unwelcome " lucky you " updated to my dongle this week which made my PAP2T unregistered, and my MJ has changed it's password every time I plugged it in for 2 days, today I use my old password again ( i.e the password I used before the Aug update ) and my PAP2T works as if nothing's ever happened. The weird thing is, my dongle is now can not register, it keeps saying " waiting for configure..." and stuck there. Try it for yourself, and if it works for you, consider " Lucky You " this time.